Every December one of my favorite bloggers, Katie of Thyme for Cooking The Blog hosts a gift exchange between other foodies. Katie lives in France and her followers are from all over the world. Each of us is given a name of another participant and we are to send to them an herb or food item that is typical of the place that we live, along with a recipe or suggestion as to what to do with it. We in return receive a food gift. It is always so much fun to see what shows up on my doorstep. This year I received this abundantly beautiful Ristra arrangement of drying chile pods. It is not only an ongoing source of chilis to be picked, but it a beautiful addition to the kitchen decor. I am looking for just the perfect spot to hang it. It was sent to me by Dan who lives four miles from the Mexican border in El Paso Texas. He does not have a blog but is known in his comments as Tiki Pundit. Thank you Dan! I love it. If you would like to give a ristra to someone on your gift list go here for a good selection. Dan sent me a recipe for New Mexico Red Chili which is a pork stew that uses lots of the chilis and is braised slowly to meld the flavors and render the pork succulently tender. He also sent me directions on how to dry the pods to be used in the recipe. The chili ristra’s pods were harvested in September and are not completely dried yet, so to use them in this recipe, the pods used had to be dried further in the oven. Although it took me awhile in preparation, once this stew went into the oven, I could tell that it was worth the effort. I used fewer pods than the recipe called for because I didn’t know how hot they were. The recipe calls for 1 cup ground chilis. I used 8 pods that I dried in the oven until they were crinkly dry and ended up with 1/3 cup of ground chilis. It was perfect for us, although David felt it could have been a little hotter. I served it with rice, but it would also be good in tortillas with sour cream and other Mexican condiments. Preheat oven to 350 degrees F. Heat 2 tbsp. oil in a large, heavy-bottomed, ovenproof pot over medium-high heat. Add onions and garlic and cook, stirring, until onions are golden, about 6 minutes. Remove from heat and transfer onions and garlic to a bowl with a slotted spoon. In a large bowl, stir together flour, salt, cumin, and pepper. Add pork and toss to coat. Return pot to medium-high heat, add remaining 1 tbsp. oil, and working in batches, lightly brown meat on all sides, 5 to 7 minutes per batch. Transfer meat to a separate bowl as you go. Return onions and garlic to pot. Grind dried chile pods in a food processor. Sprinkle onion mixture with ground chiles and cook, stirring, 2 minutes (mixture will be thick). Add broth, stirring to loosen browned bits from bottom of pot. Whirl sauce in a blender until smooth. Return sauce to pot and add bay leaf and reserved pork. Cover pot, put in oven, and cook 1 hour. Set lid slightly ajar and cook until pork is fork-tender, about 1 hour more. Remove bay leaf before serving. 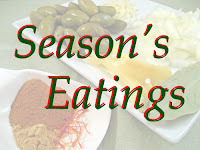 Katie will be posting all of the Season Eatings blog posts sometime between Christmas and New Years. I am anxious to see what my recipient did with her Key Lime Juice and Southern Pecans. 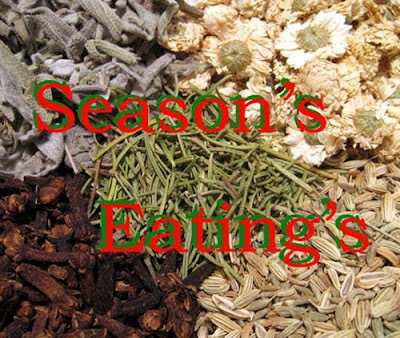 Season’s Eatings everyone! Posted on December 8, 2010 at 9:59 am. It is so much fun to share during the holiday season. Gift exchanges are rampant and the blogging community is no exception. My blogging friend Katie of Thyme for Cooking the blog is the hostess of this holiday exchange which anyone can sign up for. 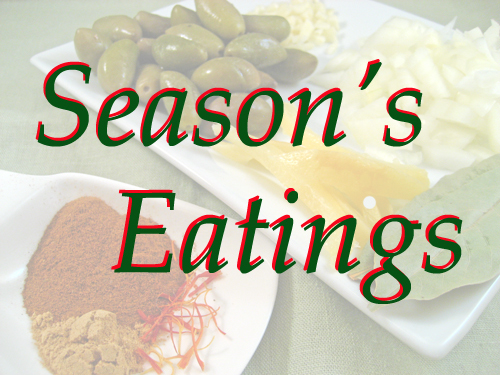 Season’s Eatings is a spicy/herby/foodie gift exchange to celebrate the holiday season. Katie put all of our names into a virtual hat and paired us up with a Secret Santa. Each person sends a small gift of a local herb, spice or other food that is unique to where they live. They can include a recipe to utilize the food item and it is up to the recipient to make something with it and blog about it. Katie will be doing a round-up of all the participants before the holidays. What is so great about this event is that we live all over the world. Katie blogs from Provence and we have been following her often humorous adventures in restoring a French farmhouse. She paired me with Cindy Ruth who blogs from Alaska. Check out her blog; Baked Alaska. Cindy sent me the items below. The box included Wild Salmonberry Jam which she explained was a berry similar to a raspberry that grows in Alaska. That was a relief because I had visions of salmon roe made into jam. Also included were three spice blends that would compliment fish or meat and a wonderful locally made chocolate/coffee bar. I thought about using the Coho Mojo spice blend on grilled salmon and I still plan on doing that, but for this post I decided to use the Matanuska Pepper Blend to coat some thick pork chops. After sauteeing the chops I placed them in the oven to finish cooking and deglaced the pan with white wine, the salmonberry jam, and balsamic vinegar. The meal was delicious. The chocolate bar was dessert. Thank you Cindy Ruth. Now I wonder what Meredith – deedee in france will do with the grits I sent her. I also sent her a grits cookbook with a recipe for Bill Neal’s shrimp and grits. Hope she likes grits. Season’s eatings to all of you. Posted on December 18, 2009 at 2:04 pm.